The very notion that we spent £500 million on Tamiflu – with information about over half of the clinical trials still being withheld – is nothing short of absurd. For context, £500 million is 5% of the total NHS drugs budget (£10 billion) for one year. This ongoing issue of secrecy around clinical trials wastes money and harms patients, and it has persisted for several reasons. Firstly, the issues are slightly complex. 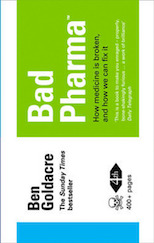 I hope that my book has done something to make them more accessible, and as I explain in this post, I think industry and researchers would find it very difficult to honestly tell patients the truth about how they withhold vitally important information on the effectiveness of pills. Secondly, regulators, medical membership bodies, and patient groups – many of whom are well-funded by industry – have failed to act in patients’ best interests. Some of these organisations, as we will soon see, have actively obstructed efforts to address the ongoing issues around trial transparency. Lastly, the ABPI – the UK pharmaceutical industry body – have falsely claimed that all of these problems are “historic” and now fixed. This is entirely untrue, as has been previously discussed. In my view journalists and politicians should be very cautious about accepting any statements from such an organisation, if they are willing to make entirely false statements in order to dismiss public discussion of serious ongoing threats to patient safety. Their stance is also, in my view, self-destructive, since the ongoing secrecy about clinical trials is indefensible, against the interests of patients, but also against the interests of industry (as I argue in this piece for the pharmaceutical industry journal Scrip). In light of all this, it’s great that there are so many MPs who understand the extent of these problems, and are calling for action. Adam Afriyie and Julian Huppert, as you will know, have both been good friends to science; Valerie Vaz and Barbara Keeley have made longstanding contributions on health (Barbara has been especially strong on carers’ issues); David Davis is a mighty figure on transparency and civil liberties; and Sarah Wollaston has been extremely effective at raising the issue of clinical trials transparency in parliament. If any of them are your MP, do please break with tradition and write to tell them a positive letter, on how pleased you are that they are involved in this extremely important campaign for access to trial data! We are writing to you in your capacity as Chair of the Public Accounts Committee to ask if your committee would consider conducting an inquiry into the waste of NHS resources caused by the concealment of trial data for drugs, medical appliances and implants. For many years the scientific community has been pressing for open data in drug trials. Please find enclosed a briefing from Dr Ben Goldacre, also sent to the Department of Health, which provides an excellent summary of why trial data transparency is vital to ensure patient safety. This issue also has major cost implications for the NHS. The decision to stockpile Tamiflu is the most high profile example of how significant NHS resources can be spent on drugs without full disclosure of clinical trial data. In 2009 the government spent £500 million on Tamiflu, a drug manufactured by pharmaceutical company Roche and licensed for the treatment of influenza. In the UK, Roche are allowed to claim that Tamiflu can reduce the risk of complications from influenza, such as bronchitis and pneumonia. In the USA, Roche is not attempting to make this claim. It is thought that the American drug licensing body, the Food and Drug Administration (FDA), has had access to different data to that made available to the relevant UK authorities. Roche has conducted over 123 clinical trials, of which at least 60% remain unpublished. The company has refused to disclose full information on these trials to Cochrane researchers, despite promising to do so in December 2009. Without this information, UK regulators and doctors cannot properly assess the clinical benefit (if any) of Tamiflu. It could be that the previous government spent 0.5% of the entire 2009 NHS budget on a drug which the manufacturers were aware was no better than a placebo. Without all the clinical trial data, we cannot draw firm conclusions, but it surely cannot be right for a pharmaceutical company to receive £500 million of taxpayers’ money if it withholds information about its own products. In the event that your committee finds Roche has deliberately concealed evidence which shows Tamiflu to be simply a placebo with side effects, you might wish to consider a recommendation that the Government seeks repayment of the £500 million cost. Tamiflu is just one example. There are many other drugs which pharmaceutical companies have sold whilst withholding trial data which showed those drugs provided patients with no benefit, or worse, caused significant harm. Implants of all kinds are also used inappropriately because trial data is concealed or never collected, as in the case of PIP implants. lack of published trial data. The authors tried to get further data out of the manufacturers and failed. The same thing happened when the BMJ investigated the medical benefits of certain hip prostheses. costs associated with morbidity. In the case of hip prostheses the NHS has had to pick up the bill for revision procedures, along with the costs of incapacity and care. These failings are partly a consequence of how medical implants have been regulated (the Science and Technology Committee has issued a report on this) but also of the lack of transparency regarding trial data. Doctors and patients are left to decide what treatment they should use based on what the manufacturer is prepared to tell them. There are failings at every level, from ethics committees which allow trials to proceed without insisting on data being published, to organisations like the National Institute for Clinical Excellence and the European Medicines Agency which do not insist on receiving all the evidence – and then making it available to all interested medical researchers – before granting regulatory approval for drugs, appliances and implants. Sharing information can be a very powerful way to protect patients, because then “many eyes” can be brought to bear on what are often complex questions. Problems with Rosiglitazone, Tamiflu, Vioxx, and many devices were spotted by the global community of independent academics, rather than by individual countries’ regulators acting behind closed doors. Most manufacturers claim they release data. However, unless they publish relevant data in a form accessible to UK regulators and researchers, it may be useless or incomplete. The Public Accounts Committee could provide vital insight into the level of waste resulting from the concealment of clinical trial data, and hold manufacturers and regulators to account. We would be happy to meet with you to suggest expert witnesses who may be able to advise on further lines of inquiry. Is that 5% (as you wrote), or 0.5% (as in the letter) of the NHS budget? In 2010, Margaret Hodge sponsored an early day motion criticising the BMA for opposing NHS funding for homeopathic remedies (sic). Or she might consider selling it on to Holland and Barrett as a new homeopathic remedy for hayfever. duncanb, Ben wrote that it was 5% of the drugs budget (£10bn), the letter says 0.5% of the total NHS budget (about £100bn). Ben says “£500 million is 5% of the total NHS drugs budget (£10 billion) for one year” while the MPs say “0.5% of the entire 2009 NHS budget”. The two statements are not contradictory if in 2009 the NHS drugs budget was 10% of the entire NHS budget. I haven’t checked this yet. According to the figures found at: www.ukpublicspending.co.uk/year_download_2009UKbn_12bc1n_10#usgs302 the NHS total budget for 2009 was ~$105 billion, making 0.5% of total budget approximately correct. £500 million on Tamiflu is 5% of the total £10 billion drugs budget, as I wrote above. £500 million on Tamiflu is also 0.5% of the total NHS budget. £500 million on Tamiflu is also a lot of money to spend on a drug where the evidence on whether it works or not is still being withheld three years after Roche promised to share it all. It’s really a big loss of those patients who has got affected by this unhelpful treatment trails. We should stop it on the emergency basis.